They say “imitation is the best form of flattery”. But any creative would look at that and call BS. Getting your art stolen, reposted and claimed as someone else’s, or having your style copied is the worst. Such is the harsh reality of being an artist (or any creative, really). 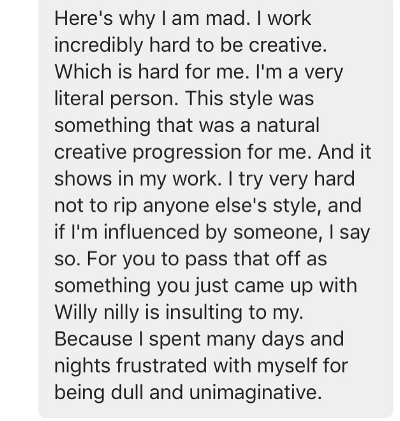 While a work inspired by your style or an art piece you’ve done can indeed be flattering (with proper credit), when someone is claiming your work as their own? That can feel awful, and you need to shut ’em down. But how do you go about doing that? And more so, how do you protect your work from getting stolen in the first place? We talked to two people with a lot of experience in this area: an Artist Shop owner who has had her work stolen more than a few times, and the co-founder of the copyright-made-easy site, Binded.com. They let us in on how to protect your art from getting stolen and what to do if it’s already been stolen. One Artist Shop owner who has struggled with people stealing her art is Monica, the owner of the “Earth to Monica” Artist Shop. 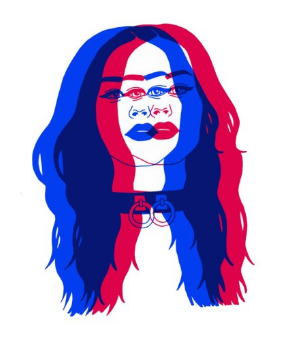 She’s dealt with people both reposting her work as their own, as well as copying work of hers and her unique style. She’s been very public about this struggle, and we talked to her a little bit about what she does when her art is stolen or reposted. 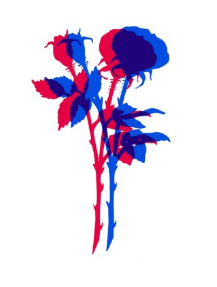 “Double Rose” from Monica’s Artist Shop. I’ve seen on Instagram that you’ve had to deal with quite a few copycat artists ripping off your style – how do you go about handling this? In the beginning, it used to drive me bananas because I was still sort of honing this style. It felt like people saw something that worked for me and all hopped on the bandwagon. If it was a dead ringer for one of my pieces, I would message them with as much kindness as I could muster (which took soooo much effort for me; I’m a fiery Leo, haha) and ask them to credit inspo or remove it completely. I’ve had someone copy my work exactly as it was and call it hers. That was infuriating. The others that are more just in my style and not exactly like mine don’t bother me as much. I’ve learned over time to sort of take it as flattery. I do get a lot of people who will do a piece like mine, tag me, and tell me what an inspiration I am. That’s the way to do it! Those actually make me feel nice haha. A post from Monica’s Instagram in which she screenshotted her explanation to an art thief regarding why stealing her work is offensive. How do you find or look for work that is copying your own? I don’t look for it anymore. But I do get messages from my followers linking me to accounts of copycats, or even people just using my images with no credit. I just love my followers so much. They say “imitation is the best form of flattery”, but I think artists would beg to differ! What, to you, separates a work being ‘inspired by’ someone else’s style and just plain stealing? Haha, I still struggle with it feeling like flattery like I mentioned earlier. I think it’s fine to do a piece in the style of another artist, as long as you still find a way to put your mark on it. Like drawing the same subject matter or in the same style with your own twist. Straight up redrawing someone else’s piece is stealing for sure. What are some resources you know of that artists can use when they think their art has been stolen? “I Can’t be What You Need” – a great example of Monica’s unique style. of IG users rally up and bombard whoever the thief is. Whether or not there was an end result to all that, I’m unsure. Like with the whole Tuesday Bassen vs Zara thing. What are some things you do to ensure your work isn’t stolen, or if it is you then have proof it was originally yours? Let’s say you want to be more proactive about protecting your work with some legal backing that carries some weight. We also talked to Nathan Lands at Binded.com – a relatively new resource in the copyright game. Binded promises to make copyrighting your work super easy by managing your copyrights for free, which we think is pretty cool. Check out what Nathan had to say about what to do when your work is stolen. What are some steps that creatives can take to protect their work from being stolen? Keep records of the copyrights you own. You need to keep track of your work and when they were created and published. Very few people do this but it is important. If you’re not keeping track of your copyrights, it’s hard to protect them. Put a copyright notice next to your work. For example, “Copyright©️ 2017 Your Name. All rights reserved.” Most people think you need to register your copyright to use the ©️ symbol. You don’t! Monitor your copyrights for infringement. Most people don’t do this, and it’s probably the most important step to protecting your work. Some people manually check with Google image search, which time-consuming. Binded is working on making it easy to automatically monitor your copyrights for free. Register with the U.S. Copyright Office. For now, it’s still necessary to register with the USCO to win statutory damages up to $30,000 and have your legal fees paid. So for work you really value, you should register it with the USCO. When a creative notices that their work has been ripped off, what’s the best step for them to take? If possible, you should immediately contact a copyright lawyer. If you feel the infringement is minor or you don’t have the budget for a lawyer, you can try taking action yourself. First, it’s important to determine if you’re dealing with a copyright infringement or not. To determine that, you need to understand the term “fair use”. In general, if someone is using your copyrighted work for commentary or comedy, it may fall under fair use. If it’s not fair use, then you should determine if it’s a user-generated content site or not. E.g. Etsy, Youtube etc. If it is, you can send a DMCA take down notice. The process is pretty straight forward and the company must respond to your request. Usually, they’ll take the work down pretty quickly. If you’re dealing with a company that’s infringing, you can try sending a cease and desist letter. The letter can include proof of your copyright, a link to the infringement, and a request to take it down. We’re working on solutions to make all of this a whole lot simpler. What are some ways someone can prove work is theirs if it’s been taken? When we created Binded, we interviewed artists, photographers, and designers. Most of them told us that they send a link to their website or Instagram as “proof”. Which obviously isn’t taken very seriously by the recipients. With Binded, we’re working on making it a lot easier to prove you created your work. We create a permanent fingerprint of every image copyright on Binded. Soon we’ll give you ways to share that proof with others, which is going to look a lot more reputable and serious. We’re also working on plugins for all popular creative tools, like Lightroom and Photoshop. We’re going to make it simple to create proof at time of creation with whatever tools you already use. So when you create something it’s binded and very hard to dispute who created it. What is the most common situation you’ve seen where people’s work is being stolen? There are so many different situations that are common that we could write a whole blog post just on that. It’s really a bigger problem than most people realize. A common situation is fashion brands using artwork and photos without permission. We hear about this a lot. That’s why I think it’s awesome that Threadless is a platform that actually supports creators. We’re starting to collect data on copyright infringements. The surprising thing is how big the names are involved. For now, we‘re not going to name anyone, but in the future, we may publish a report of what we’ve found. The results are pretty shocking. I’m sure many companies don’t do it on purpose. But some are definitely doing it on purpose and consider it a cost of doing business. They probably think most creators aren’t monitoring their copyrights because it’s too hard or expensive. So most people will never find out about it. We’re going to change that. Watermark your work on social media: this makes it harder for someone to take your art and makes it impossible for someone to straight up screenshot and repost your posts. Sign it: never a bad idea to have a little signature near your work, and similar to watermarking! Keep your sketches: keep the process art from your design – keep photos of it or even post pictures of it so that you can show that you a: started working on it before the person who stole the work posted it and b: can use that process art as proof that yes, this idea came from you. Post pictures of your work IRL: if it’s a hand drawn piece, take a picture of it in your notebook with the pen you used to create it, or a picture of it on your desk. Add a copyright message: if you’re posting on Instagram, add in the description section a little copyright with your name and the date, as well as a warning to please not repost your images (maybe even a little “I’m watching you 👀” message). Be nice to your fans: your fans and followers are a huge asset – they can alert you to people who might be trying to steal or copy your work, and can vouch for you as well. COPYRIGHT DAT WORK! Copywriting your work isn’t a bad price to pay for protecting it. I think the “copying someone’s style” is a tough one. Who’s to say that that artist you are “copying” isn’t “copying” someone else. There’s a good chance that they are certainly influenced by another artist or artists. So, someone’s “style” is one thing. Actually creating a piece of art that is a “copy” is wrong. At least in most cases. I agree. As for the 3D style, pictured in the article, that is a style that went out in industry trend reports starting 2013 or so. Maybe earlier. The trend report is literally reporting trends for creatives to follow in the consumer products world. The style shown has been used from what, the sixties at least. and other information, is there any other web page which provides such information in quality? Previous post Holiday Countdown: What Are the Top Selling Products in Artist Shops?